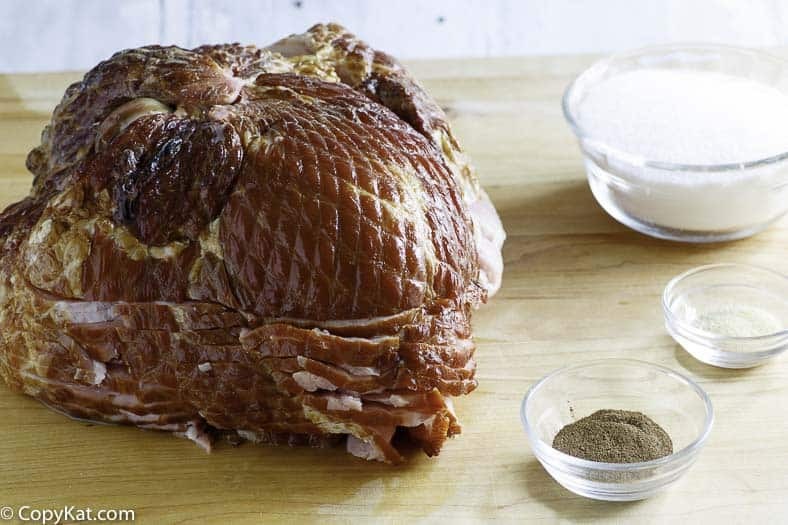 Have you ever wondered how to make Honeybaked Ham? Honestly, these are some of the best hams you can get, but you may not live near one, and they can be a little pricey. When you are on a budget it can be stretch to spend the king’s ransom on one part of your meal. 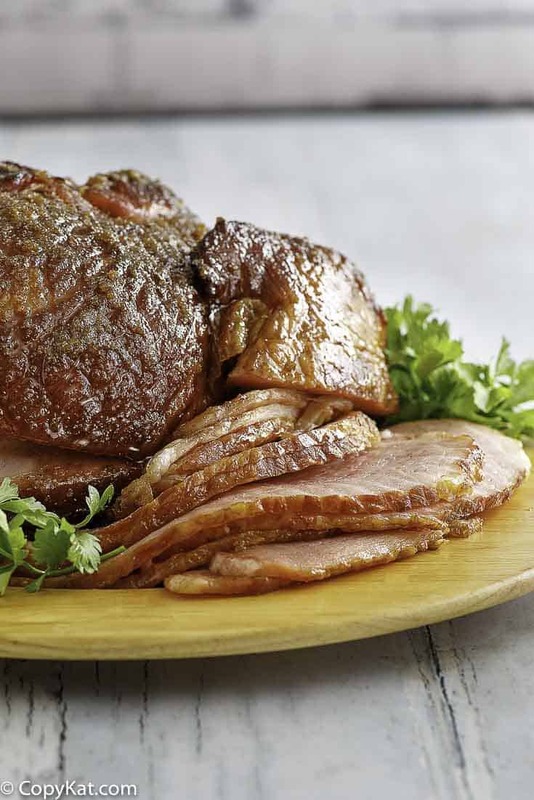 A honey baked ham from the Honey Baked Ham Co. is one of the best-tasting hams you can buy. But, you may not live where you can easily purchase one, and, in any case, these hams can be a little pricey. When you are on a budget, it can be somewhat of a stretch to spend a king’s ransom on just one part of your meal. So, if you have you ever wondered how to make a honey baked ham at home, let me show you how. About the Honey Baked Ham Co. In 1957, Harry Hoenselaar opened the first Honey Baked store in Detroit, Michigan. He aimed to produce the best-tasting ham in the world. 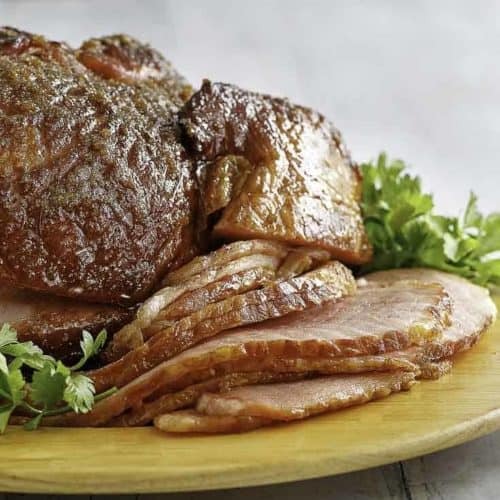 He did so by selecting only the highest quality smoked ham-on-the-bone and creating a special curing procedure that brings out a one-of-a-kind taste, which is enhanced by a crunchy sweet glaze. Harry’s spiral-slicing process has been patented and makes his Honey Baked Ham an easy-to-serve centerpiece for holiday dinners. Today, the Honey Baked Ham Co. is still a family-owned business serving customers at over 400 retail locations in the US as well as online. Read more about the history of the company. 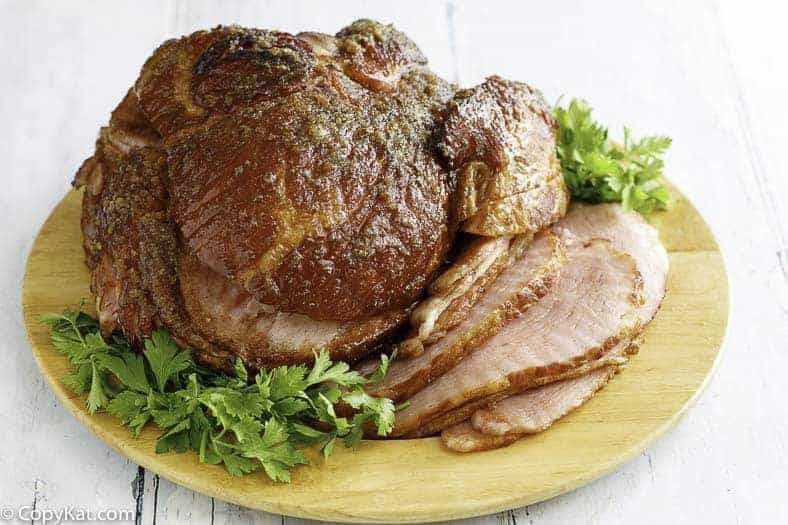 Now, one question I have received multiple times is: do you need to cook your ham when making this recipe? The answer is no if you buy a cured ham. Most hams are already cured, and this means they are ready to eat. It’s your personal preference to choose to serve your ham warm or cold. I personally like to just heat my ham in a 300-degree oven for about 20 to 30 minutes. This will not give you a hot ham, but it takes the refrigerator chill off of it and warms it up to something a bit warmer than room temperature. Looking for ideas for leftover ham? One suggestion I have is to prepare the ham inside your house. It’s often windy outside, and you will find that your blow torch will go out all of the time. I am using a blowtorch I got from the Home Depot; it was inexpensive and works great. You can spend money on those gourmet ones, but they are three times the price. My philosophy is why spend extra cash when you don’t have to? You can save so much money when you make honey baked ham from scratch. Don’t be intimidated by cooking with a blow torch it’s easier than you think! Once you unlock the secrets of blow torch cooking, you will soon be a master at creme brulee! You can save so much money when you make the Honeybaked ham from scratch. in a small bowl combine sugar, pumpkin pie spice, and garlic powder. Mix well. Remove ham from the package, and do not pat dry. Place ham on a large baking sheet. Sprinkle sugar blend over the ham, coating well. Quickly wave the blowtorch over the sugar coating, not staying in any one place for too long. Be careful not to allow the sugar to burn, move the flame on quickly if the sugar begins to brown and smoke. Once you have a thin layer of hardened sugar on the ham, sprinkle on more, and touch with the flame to build up the crust. If you prepare the ham ahead of time, do not wrap with plastic wrap. If you wrap with plastic wrap the sugar crust will come off. Store loosely covered with foil before serving. This whole process takes about 30-45 minutes. Be sure to move slowly and be patient, and you will have great results. read the label on the ham package it will tell you how to cook it normally about 325° for ten to fifteen minutes per pound or an internal temperature around 145° if you want it heated thru. If I do want to serve a warm ham though, what temperature should I heat it at and how long? It says 20-30 min. for a just above room temperature, but not how long for a warm one.